John Penrose Christoe was probably the key person at Cadia after Robert Morehead, the Colonial Manager of the Scottish Australian Mining Company. Christoe, through his connections in Cornwall, ultimately secured the position of Mine Captain for Josiah Holman in 1862. Christoe also had influential connections in Kapunda, South Australia, as well as in Byng, the Cornish Settlement in New South Wales. Before there was any need to seek miners from overseas, Christoe could draw upon these connections to find Cornish workers, skilled in deep mining techniques. But it was through his marriage to Dorothea Blood in December 1852 at Kapunda, South Australia, that Christoe was able to attract the third key figure to Cadia, the father of the bride, Matthew H. S. Blood, Esq. 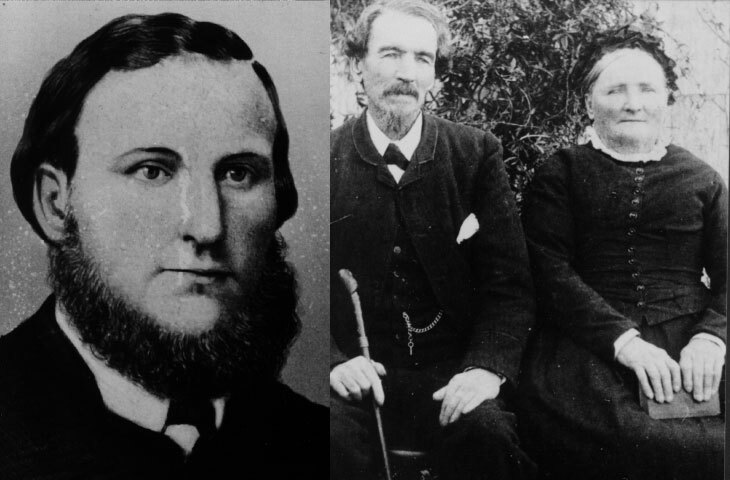 M.D and J.P.
Matthew Blood was born in Limerick, Ireland, on 6 December 1806 and married Marianne (nee Church) on 14 March 1833 at Ennis, County Clare. Several children were born in Ireland, before the family emigrated to South Australia in 1847, escaping the effects of the Potato Famine. Dr. Blood became a respected citizen of Kapunda in South Australia, a Justice of the Peace and later a major of the town council. He was above all the Medical Superintendent of the Kapunda Copper Mine. Dr. Blood moved to Cadia with his family and became the “medical man” for the miners at Cadia, as recorded in Bailliere’s New South Wales Gazetteer in 1866. William Smyth Blood (1839-1905), his son, became a storekeeper at Cadia in 1863 and remained at Cadia for many years, with only a brief interlude. John Penrose Christoe, Josiah Holman and William Smyth Blood became the leading community members at Cadia. They were the founding board members of the School Board, appointed in 1867. They were prominent in preparing not only the application for a school in 1863, but also several other petitions, one for a Post Office in 1863 and another for a Common around the mine in 1866. There is no list of employees at Cadia for the early years, but it is these documents that provide the names and employment details for many of those in the Cadia Community. The family ties and connections of the leading community members at Cadia is an indication of the means by which the Cornish miners and Welsh smeltermen found work on an international basis or after emigration. These relationships were not restricted to mine management, but permeated the Cornish community that provided a significant part of the workforce. Thus Christoe could draw upon his contacts with the Carangara Mine and the Byng (Cornish Settlement) community to find the miners he needed. No doubt he also had additional contacts at Kapunda in South Australia, but we know of no specific cases except for Dr. Blood and his family. The employment of Captain Johns, who was at Cadia by 1861, is an example of this process. Though we know little of his background, John Johns was one of the shareholders in the Canoblas Mining Company, would have been well known to those at Byng, the Cornish Settlement, and was probably personally known by Christoe. Johns remained a miner at Cadia until at least 1866, if not later. While there was a large Cornish contingent at Cadia, particularly the miners, there was also a substantial number of others. Cadia was never to be like Kapunda, Burra or Moonta-Wallaroo in South Australia, where the Cornish and Welsh communities predominated to the exclusion of others. Cadia could also draw upon those returning from the goldfields or other migrants. Notably it was the native born or “currency lads” who possessed the bush skills making them expert teamsters and sawyers, essential skills for the success of the mine. Only later in 1863 did the Scottish Australian Mining Company resort to sponsoring migrants, but only for the specialist task of smelting, including Thomas Hussey, William Williams and Lewis Lloyd. The first two share surnames with some of the major smelting interests in Swansea. Some have claimed that Lewis Lloyd, born in Wales on 27 September 1842 and trained as a smelter at Caermathen, was unable to speak English when he arrived and worked for a few years at Cadia. Lewis Lloyd went on to open Lloyd’s Copper Mine at Burraga and had several other copper mining interests, also serving as a Member of Parliament. Thomas Hussey remained at Cadia and became “Chief Smelter to the Cadia Copper Mining Co” and replaced John Penrose Christoe on the School Board. Other smelters at Cadia in the 1860s included William Jones, born in Wales in 1835, Joseph Grey / Gray, born in England in 1838, and Daniel Magee, born in Ireland in 1842. It was not only the company that sponsored migrants, but also other miners and their families. Sponsored immigrants at Cadia included Robert Northey and his family, Edward Miner and John Bice. Cadia residents who sponsored the passage of others included Eynon Deer, William Selwood and Walter Trathen. (left) Joseph Gray, born in England in 1838, was one of the copper smelters at Cadia in the 1860s (French Collection). (right) William Williams and his wife. He was another smelterman at Cadia in the 1860s (French Collection).